Get your Margarita blended or on the rocks! I first wrote about Wahoo's and their lovely Taco Tuesdays here. It's a great place to relax and enjoy inexpensive soft tacos and margaritas with friends. Very laid-back...I love this place! BUT, recently, I have also come to discover their delicious burritos that you can order "WET." 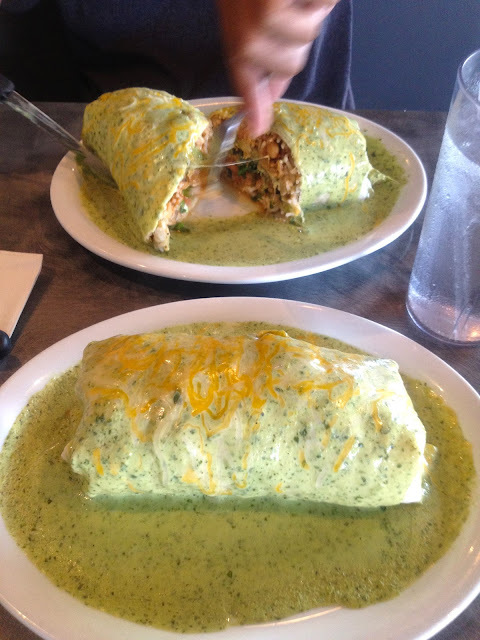 I used to go to the Ward location for years and order their Classic Burrito with shrimp, only to realize NOW that you can order it with red or green sauce and cheeeese on top! My one gripe is that I wish they advertised this option (is it on the menu??) or at least asked customers upon ordering at the cashier (Thank you to the nice lady at the Kahala location that asked!). I really believe that if more patrons knew about this, there would be NO hesitation in ordering their burritos wet (or maybe it's just me who didn't know! You tell me, readers!). It's unbelievably tasty. If you're like me and need some sort of sauce on your dry burritos, then you must try this. Joe and I first ordered our burritos wet and enjoyed it thoroughly. We've since gone back a second time where he enjoyed the Outer Reef Burrito, which includes sour cream, guac, white or brown rice, and white or black beans inside. "Make it a wet burrito, too!" I also really like the fact that they give lots of filling options. Not just the usual chicken, beef or shrimp. There's also carnitas, fish, carne asada, tofu, mushrooms, vegetarian, and Banzai Veggies (veggies sauteéd in teriyaki sauce). PS- Besides their awesomely-wet burritos, they have a wide variety of other delicious menu items. Choose from taquitos, quesadillas, nachos, baja rolls, bowls, combo meals, salads and sandwiches, tacos and enchiladas and even a Kiddie Menu! PSS- From 3-7pm every day, it's Happy Hour! 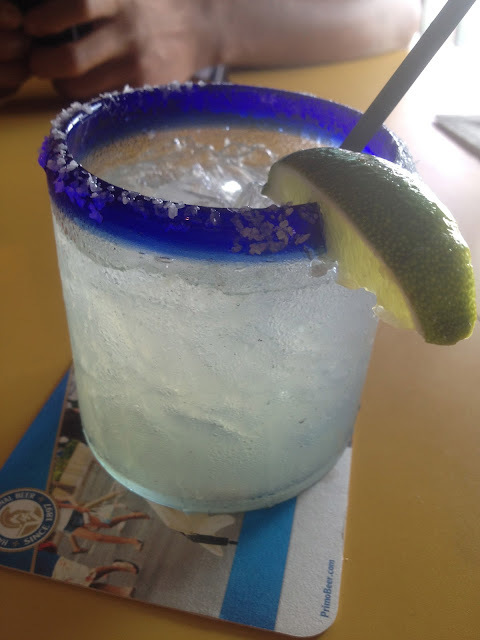 You know what that means...MARGARITA HOUR! $5 Margs to be exact! Joe's Banzai Burrito with chicken. The Banzai Burrito comes with Banzai Veggies, white or brown rice, black or cajun white beans and salsa. Classic with Shrimp- comes with lettuce or cabbage, cheese and salsa. And more CHEESE on top if you order it WET! Amazing after a long day of work.